Kramvig, B. and Methi, H.. 2018. Stories of hope: The dark ecology journeys co-creating tourism research. 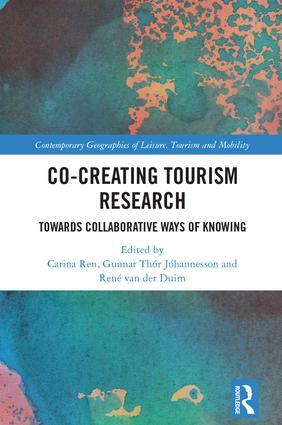 In Co-Creating Tourism Research. pp 162-179. This chapter explores the co-creation of knowledge and how art– science worlding reopens both past and present memories, reflections and ambitions. Dark Ecology (DE) initiated theoretical lectures, artist talks, discussions, curated walks and commissioned art installations, sound walks, concerts and performances that unfolded through a Dark Ecology Journey held in 2014, 2015 and 2016. The story of DE is stories of collaborative ways of knowing, where humans and non-human entities in the border area of northern Norway and Russia come together. An artwork situated in an untraditional setting will always depend not only on a physical location but also on local knowledge and know-how, which feed back to the work in some way or another. The different DE events work as new agential cut into the Arctic imaginary. Furthermore, these apparatuses not only cut things apart but also perform new realities in patterned ways.